Here it is then, the ultimate review table to help you find the best audiobook services on the market. From our in-depth reviews, we have highlighted which we think are the best audiobook subscriptions around. You will see audiobook services that have the credit-based system, unlimited streaming subscriptions, and discount pricing memberships. Meaning that you can choose your preferred subscription method to start listening to some of the best audiobooks. The best audiobook services offer hundreds of thousands of titles and are always looking to add more every week, month and year. This is just one advantage of using the monthly subscription-based audiobook apps. They offer so much more and you won’t worry about breaking the bank. With prices as low as £6.99 per month for 1 audiobook or $8.99 for an unlimited audiobook service! Carry on reading to see which of the audiobook services that we reviewed came out on top. When we rated each audiobook service we took into account five key metrics, which you can see below. We believe that the best audiobook services should at least reach an 8 out of 10 on these standard criteria. Ease of use – We assessed both the best audiobook websites and their apps. How easy it was to locate and purchase top titles. How simple to get in touch with the support team, as well as how easy to cancel your membership, should you need to. So there you have the main metrics that we used to review each audiobook service. When it comes to the overall score we judged that on these key points and our overall satisfaction after using the product for a lengthy amount of time. If we weren’t satisfied then we wouldn’t have added them to the best audiobook services list. After reviewing all of these audiobook services using the above criteria, we came to the conclusion that Audible is the best audiobook service in 2018! They stock over 200,000 titles, offer 4 separate membership options and have exclusive readings that you can’t find elsewhere. There cheapest audiobook membership will cost you £7.99 per month, which is definitely worth it if you want access to their amazing service. If you are based in America you can also benefit from 2 free audiobooks during your free trial. Sadly, we only get 1 here in the U.K.
That definitely doesn’t mean that the other five won’t be a great fit for you. Audiobooks.com and Kobo were a close 2nd and 3rd in our scoring. Also, if you want your audiobook subscription to offer you an unlimited listening service then we recommend going with Playster or Scribd. Which audiobook service has the best app? As you can see one of the key metrics that we rated was audiobook apps for each of these services. We think that it is also one of the most important. Listening whilst you are on-the-go is what we love most about audiobooks. Therefore the audiobook service needs to have a high-quality, user-friendly app. That is exactly what Audiobooks.com offers, for us, they have best audiobook app. Read our full review or sign-up now for their 30-days free trial. Which are the cheapest audiobook services? When you are picking an audiobook service your first concern is probably going to be the price. We feel that all of the audiobook memberships reviewed here are affordable. Getting the most value for your money is definitely important though. If you are looking for the cheapest audiobook service on the market you are looking for Scribd. This is an all you can listen to type of subscription that costs just $8.99 per month. However, if you want to keep your audiobooks in case you are going to cancel your membership at some point, then the cheapest service would be Kobo audiobooks. Their service costs £6.99 per month for 1 credit. An additional 3 credits can also be purchased at any time for £19.99. You can try both of these free for 30 days when signing up for an account. Kobo by Rakuten now offers audiobooks. Benefit from the cheapest subscription on the market, and buy additional credits whenever you need. Perfect for all types of listeners. They also offer a 30-days free trial upon registering! The best audiobook subscriptions allow you to buy audiobooks directly from their stores. However, this would mean that you are paying full price for a title. Luckily these audiobook services have different monthly memberships that enable their customers to enjoy audiobooks for much less. We have detailed below, how these different audiobook subscriptions work and which services use which system. Unlimited audiobook subscriptions are quite self-explanatory. Just like Netflix, the audiobook services that offer this system allows you to listen to as many audiobooks as you like throughout the month. Obviously, this membership option doesn’t allow you to keep the audiobooks should you decide to cancel at any point. Scribd and Playster are the only two audiobook services that offer unlimited audiobook subscriptions. Let us take a quick closer look at the two. Scribd will cost you $8.99 per month and Playster is slightly more expensive at £14.95 per month. Out of the two Playster does have a bigger store offering, however, it is almost double the price. You can try them both for free for 30-days, and then make up your mind about which is the best-unlimited audiobook subscription on the market. Playster is the first service we look at that offers unlimited audiobooks. They have priced themselves higher than other audiobook services at £14.95 a month. But, to be fair they do offer more audiobooks when compared to Scribd. We suggest that you use the Playster free trial before going ahead with their full service. By doing that you can see if you will be a regular user, if not maybe a credit based subscription service, like Audible, is better suited. To get free audiobooks for a month from Playster just click on the button below. Scribd offers audiobooks, ebooks, documents and articles for one set monthly price. All of their media is offered in an unlimited use subscription service. For just $8.99 per month, you can listen to as many audiobooks as you like. If you are the type of person that gets through one audiobook per week then we suggest you try Scribd. Their audiobook store isn’t as large as Audible, however, you will always find something to listen to. Together with Kobo, they offer the cheapest audiobook service. They offer fewer titles, but definitely more for your money. You can see if you enjoy their unlimited audiobook subscription for free for 30-days. All you have to do is click the button below and sign up. Hibooks is a new audiobook app that offers unlimited audiobooks for a set monthly price of $9.99. You can only listen through the hibooks mobile app, so this service isn’t for people that also enjoy listening on their computer. Feel free to download the app and explore their offered titles before registering. Also note that you get 3 days free listening when you register, 10% of the Scribd and Playster free trials. The next subscription system that we will talk about is the monthly credit based audiobook membership. This is arguably the most popular method out of the three as people like to keep the audiobooks that they buy. The way it works is that you will pay a monthly fee and receive 1 or 2 credits per month, depending on your chosen package. You can then redeem these credits for audiobooks of your choice. Audible, Audiobooks.com, Kobo Audiobooks, and Downpour all use this system. The monthly subscription prices range from £6.99 to £10 per month. Kobo is the cheapest per month followed by Audible and Audiobooks.com. Audible is our number 1 audiobook subscription service on the market. This is due to a number of reasons, most importantly their audiobook store offering. Audible currently houses over 200,000 titles and this number is growing daily! With a well-priced membership of just £7.99/$14.95 per month for one audiobook, it’s hard to disagree. They also have their own publishing division, Audible Studios, where they create exclusive audiobooks and audible shows. Which include titles like ‘The Martian’ and Sherlock Holmes: The Definitive Collection read by Stephen Fry. For more information on Audible’s service check out our full review. Audiobooks.com is our next best credit based service that we want to talk about. They currently house over 120,000 titles. Their audiobook app is one of the simplest to use, and simplicity is key remember. They have a feature called Instacredit that allows you to purchase new audiobooks with one click whilst using their app. Their price point is the same as Audible, £7.99 in the UK and $14.95 in the US. You can try their audiobook subscription service for free. All you have to do is register for an account and you will receive a 30-days free trial that entitles you to one audiobook. Click the button below to get this amazing offer! The ebook giant Kobo entered the audiobook fight in late 2017. They must have seen the market growing with the recent rise in audiobook sales and wanted a piece of the pie. They have undercut Audible and Audiobooks.com on price. To receive one audiobook every month it will cost you £6.99 or $9.99 per month. They offer the cheapest credit based audiobook service on the market. Their audiobook offering is growing rapidly as they have strong connections with publishers already. They have two downfalls for us. You can only listen via their mobile app and you can’t purchase a new title through the Kobo app. That isn’t to say that they don’t offer a good service. Kobo is great if you are looking for one of the cheapest audiobook services. You can trial Kobo audiobooks using their free trial. Click the link below to benefit from this. The final credit based system is Downpour. They have a solid audiobook offering with over 100,000 titles. You can enjoy an audiobook a month from Downpour for $12.99 per month. This is good news if you are a customer from the United States, not so good if you are based in the U.K. Downpour does have a trick up their sleeve though. We are talking about their audiobook rental service. If you aren’t looking to own the audiobook forever, then you can rent the title for sometimes up to 70% of the full price. Check out Downpour’s offering via the button below. The last subscription system that we are going to cover is the discounted audiobook offering. The way it works is that you pay a small monthly fee which then entitles you to 35-50% off each audiobook. This is dependent on how many audiobooks you buy each month. To be honest, this audiobook membership method is our least favourite as it usually doesn’t work out cheaper than the other two options listed. The pros are that you get to keep the audiobooks forever, and with Audiobook Store the titles are DRM free. Audiobooks Now and Audiobook Store are the two audiobook services that offer this system. You will have to pay $4.99 per month with Audiobooks Now to receive their membership discounts of up to 50%. Audiobook Store is slightly more expensive at $5.95 a month for their FlexPass membership. Audiobooks Now offer audiobooks at a reduced cost. If you have a membership with them you can gain 35-50% off full price titles. You will have to pay $4.99 per month for this deal, so depending on the book you choose it’s not always cheaper. They do offer a wide range of audiobooks which is good. When you register, on your first audiobook purchase you will receive 50% off the full price. Get a cheap audiobook and browse their titles further using the link below. Our audiobook services page wouldn’t be complete if we didn’t include the best free audiobook services that are available. Both of the free audiobook services that you will find below will require you to have a library card (digital or physical), so if you aren’t already registered to your local library or an online library then you will have to do this. Once you do have a registered library card you can easily withdraw audiobooks for free. The store selections will vary depending on the library. 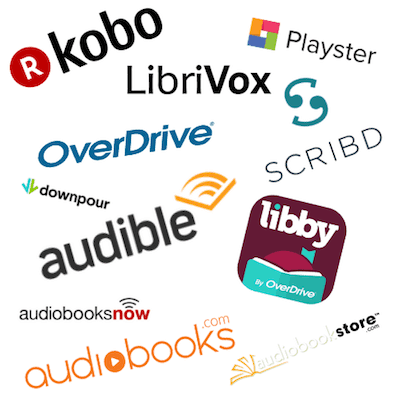 The first of the free audiobook services that we will introduce you to is OverDrive. They have also recently launched a new app called Libby, and we’ll explain the difference between the two later on. Firstly, the OverDrive and Libby mobile apps can be downloaded on any iOS or Android device. Libby is also available for Windows device users, unlike the OverDrive app. So, the best free audiobook service for Windows users is definitely Libby. Libby, however, is just an audiobook app, whereas OverDrive is available to use on your desktop too. To be able to access free audiobooks (and ebooks) from OverDrive or Libby you will need to locate your local library and enter the code on your library card. Once you have completed this step, you will then have access to withdraw audiobooks. You might be waiting a while for the most popular audiobooks, but with a bit of searching, you’ll find something that interests you. As we mentioned before, the titles on offer completely depend on what your local library stocks. Hoopla works in the exact same way as OverDrive and Libby, by connecting your library card to your local library’s online offering. One pro that Hoopla has is that it isn’t just audiobooks, they also offer ebooks, comics, movies, music and TV shows all for free. Could these little extras make it the best free audiobook service? Our focus is on audiobooks though, and Hoopla allows you free listening via your local library. They have contracts with some of the top audiobook publishers so you can expect to find some of the best audiobooks on there. Unfortunately, Hoopla is only available for residents in the USA and Canada. OverDrive is definitely the best free audiobook service, as they cater to over 40 countries! For all US and Canadian residents, you can go to your device’s app store to download the hoopla app, or else visit their website and stream online. LibriVox.org is another free audiobook service that you can take advantage of. If you are into classic audiobooks then this is the right service for you. 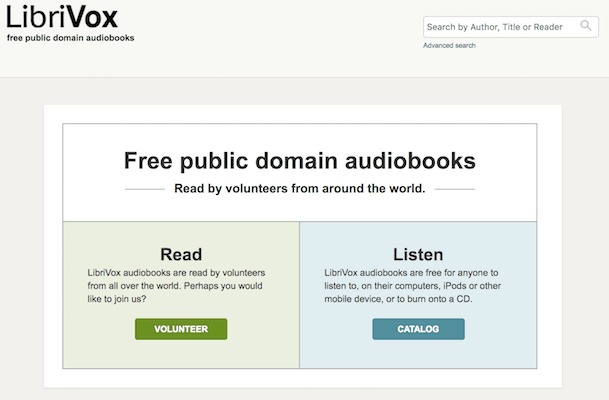 LibriVox has volunteer narrators reading books that are available in the public domain. You will find Dickens to Arthur Conan Doyle and many more great classics. The downside to LibriVox is that the audio might not always be crystal clear, or you may lose your bookmark. There are also perfect recordings that can be enjoyed, and for a free audiobook service, you can’t really complain. Download the LibriVox app or go directly to their website to enjoy free audiobooks. If you are an Apple device user then you can buy audiobooks through the iBooks app. They don’t offer a monthly audiobook subscription service. You will have to buy your chosen title outright using the card that you have registered to the Apple store. If you don’t want to download more apps you may find this useful. However, it is definitely a more expensive way of enjoying audiobooks. Kobo was a late entry, and Google was even later to the audiobook party. Google started offering audiobooks at the start of 2018, which pleased Google Assistant owners. You can relax whilst your home device reads any title from your library. The downside to Google’s audiobooks offering is that they don’t have a subscription service like Audible. You have to buy the book outright which can end up being quite expensive if you are an avid listener.